Beautiful, white, plush, and very soft. Just the right size for putting in front of the fireplace. I love it but my dog loves it more... Would buy again! Cozy up your space with this gorgeous, inviting, sheepskin rug. Naturally plush, this handmade rug has an asymmetrical shape that brings shabby-chic appeal to traditional or transitional homes. Pelt sizes do vary with each unit. As per the description, it is the most beautiful, soft, luxurious rug I have purchased. The dimensions are true to size. It is a nice fat shape, not an awkward funny looking shape like some of the other sheepskin rugs I saw. Now the problem was that it looked too small in my new 'Woman cave' that I am decorating...so I offered it to my daughter who just came back from college. She grabbed it and ran to her room to place it at the side of her bed. I have just ordered another 3 by 5 rug from Overstock which I hope will be as beautiful. And I will be ordering another one today for a new born baby as this is THE gift to give. The color is a gorgeous light, even ivory color. Don't hesitate to buy this. Great price compared to other websites. 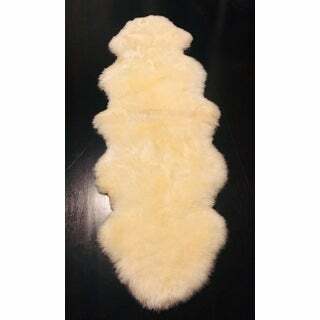 I placed the order for this genuine soft Australian sheepskin rug in the smaller size because Im going to use it in the seat of an antique Chinese chair. The sheepskin rug is soft, very white and lovely although I do wish it had just a little longer hair. It will be prefect for the purpose I intended it for and I highly recommend it to anyone looking for a smaller, genuine sheepskin rug. This rug is exactly as pictured. Thick, soft, lush, superior quality! I have another high quality large sheepskin rug and wanted a small rug too. I was worried that the color and quality might be off enough from my other rug that it would look bad. But, they look like they belong together. The thick, softness of this rug is a treat for one’s feet. I could not be more happy with this purchase and highly recommend it! Super soft.- as shown in picture. It is a very yellow-y cream though. And it does need to be aired out for a day or so. But otherwise perfect. 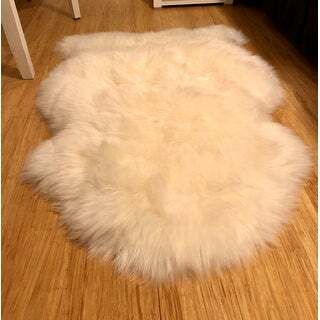 Beautiful soft, natural sheepskin rug. I now have these in several bedrooms - so soft and cozy when you step out of bed! Slightly off-white color. Very soft and plush. The color is not quite the same as the picture, slightly more of a natural color. I love it just the same. It is comfy on the feet. The perfect little accent rug to go with the cutest little chair in my bedroom. I love this sheepskin rug. It’s a great size and so soft too. High quality as always from Overstock!!! 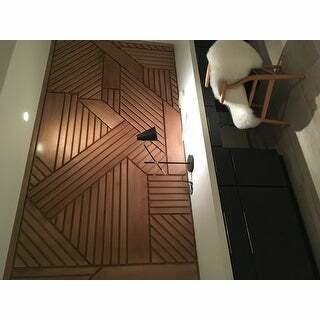 This rug looks so stylish over a sisal rug, an entryway, or near a fireplace. This Australian Sheepskin Rug was of great quality! However, I bought it for a specific room that had just been painted and, unfortunately, the color didn't match so I had to return. 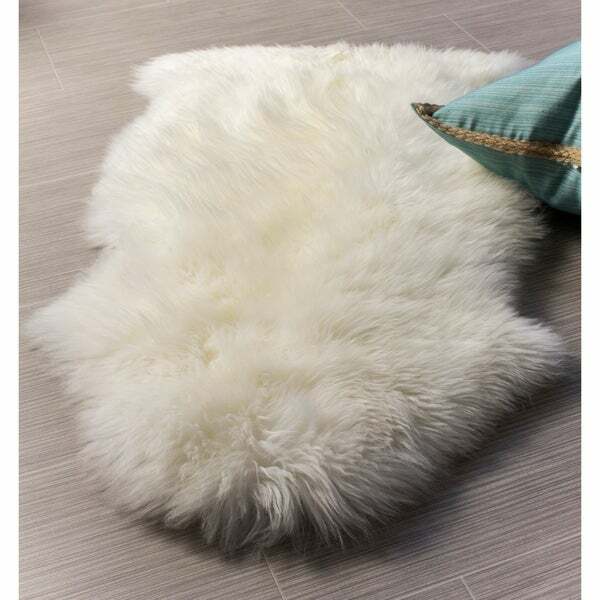 Beautiful soft sheepskin rug. The light pink is the perfect color for a little baby girl nursery. Will definitely buy more colors for the rest of the house! This is a very fluffy and plush sheepskin rug. There is no shedding whatsoever. Thus seems high quality and it has held up perfectly for the past 4 weeks. Just as pictured, very pleased! Beautiful and fluffy! Much better quality than I was expecting! This was purchased for in my granddaughter's room who is 14 months! I choose this because it was real sheepskin AND because the description stated that it could be machine washed AND dried in the dryer! There are so many rugs to choose from but the washable part was important to me! It arrived and has a big label stating DRY CLEAN ONLY! So disappointed with that! The rug itself is beautiful and soft! I will let my daughter in law decide if she would prefer a washable one, if so I will keep this for me as it is a beautiful rug! Love these. Quality. Used 4 and grouped under table. !!! Smelled bad, had to return. Beautiful just beautiful! Very pleased, I have now purchased 3 and my daughter in law would like one as a gift I will order again. The quality and size is exactly as published. This little rug is soft and plush. Service from Overstock was excellent. It made for a nice layering rug however wish I had bought a larger version. It's that nice! Got the “Natural” and it was VERY YELLOW! Had to return. If you are looking for a yellow rug, it is actually great quality, lush, fluffy and soft. Nice length to put next to a a King size bed. "What’s the biggest size this rug comes on "
The rug can be vacuumed and washed using cold water and a wool / fur safe detergent.